The WORCESTER PARK Blog :: Fund The Pond! Some Worcester Park residents may recall that the pond in Shadbolt Park, Salisbury Road used to be a haven for local wildlife. Now it is dry for most of the year because the original concrete liner has failed and the pond has become an eyesore. The Friends of Shadbolt Park commissioned a study to explore the possibilities for restoration. Wildlife enthusiast Carol Williams took it upon herself to take action, especially since 2010 is the UN year for biodiversity. A public meeting was organised in December at which members of the Surrey Wildlife Trust and the Lower Mole Countryside Project explained what could be done to restore the pond and create a more attractive space for wildlife and park users. The intention is to create a smaller pond within the area of the existing pond, using a flexible butyl liner, and create a haven for frogs, newts, toads and dragonflies. It is envisaged that volunteers under the guidance of the Lower Mole Team will carry out this work in the autumn - by which time we need to raise a little over £4000 for the project to go ahead. "The cash will be needed to pay for the new liner, hire of machinery, and materials. Nearly 40 people attended the public meeting and it was agreed that we should go ahead and try to raise the funds to pay for the project. Waitrose in Central Road featured the project in their green token scheme, which got us off to a good start, and we have received generous donations from several individual residents. We have a commitment of a significant sum from Surrey County Council, depending on getting sufficient local interest. To dream up ways of meeting our target a few of us have formed a committee and, apart from asking for donations, we have discussed a sponsored walk around Shadbolt Park, coffee mornings, a stall at the Cuddington Fair in June, and have written to banks and building societies in Central Road for small grants (none received as yet)." Some preparatory work to restore the pond has already been completed on a rainy day in February. 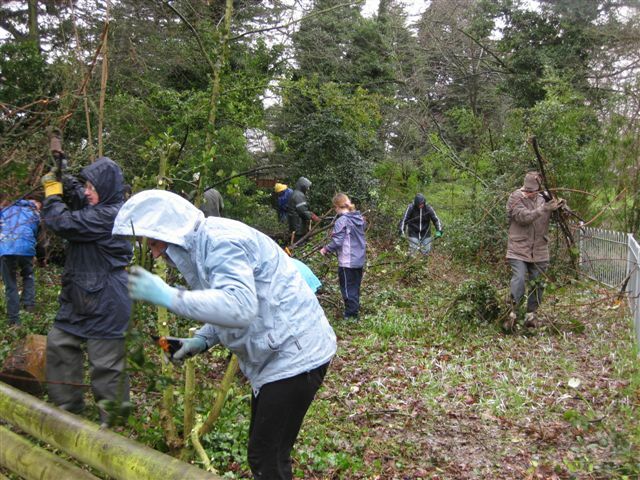 Volunteers cleared the overgrowth around the area and tidied up generally.